Even though what I wrote last winter about UK In Style’s choices for workwear have been some of my most popular posts. Most of these key workwear pieces for spring/ summer 2011 are easy to achieve. This season it’s just a straight shirt, not one with added bow. Although it isn’t clear from these photos, they both have band collar. Many patterns for a classic shirt. These are some with fitting help. My favourite new one is Vogue 8689 Custom Fit with 4 cup sizes. More waist shape than the In Style ones. For some help with other fit issues there’s Palmer Pletsch McCall’s 5433. Sorry to those of you who aren’t happy wearing shirts. In Style says “If you can buy one thing make it this”. But they do include a photo of a collarless blouse. A softer style with some quiet pretty trim at centre front. Perhaps McCall’s 5138 made without collar. So go that way if you prefer softer blouses with more shaping ! A classic shape, perhaps double breasted, or in safari style. The centre one is double breasted and collarless. The others have band collars, big pockets, epaulettes. All are belted (self fabric sash or slim dark leather). And look as if they have no waist shaping, which gives a bloused effect. 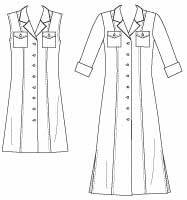 I had difficulty finding a shirt dress pattern with band collar. This Burda 7827 is the best. Omit the trench overlay and epaulettes if you want to. 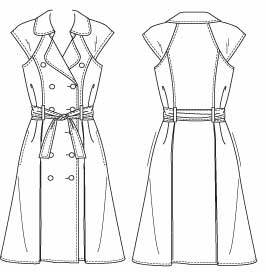 Here’s a pattern to mimic the centre ‘collarless trench’ style, by leaving off the collar : Suzy Chin Butterick 5598. A band collar looks best on me. I like the extra dimension it gives when worn open. 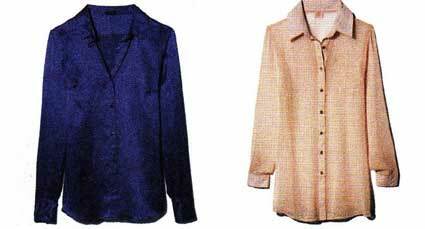 There are many shirt patterns with a band collar. So if you like this collar it may be easy to lengthen a shirt pattern to make a dress. 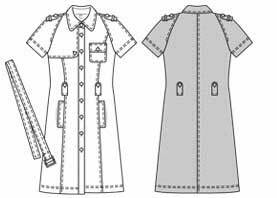 Most of the shirt dress patterns I’ve found have a flat collar. Many people with a larger front prefer this flat style as they don’t want to add more dimension to their upper body ! This Palmer-Pletsch shirt dress McCall’s 5847 has flat collar and princess seams. 4 sleeves and 3 lengths. Shaped waist, so no bloused effect, which is better if you need a slimmer look. 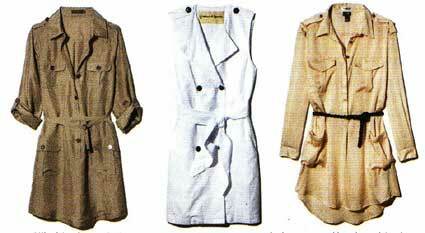 It must be said, this season’s dress may look classic, but the In Style shirt-dresses do have a bit of street/ edge. ‘Boyfriend’ style – looks like a large men’s shirt. Loose shape, and style details like a belt, floppy pockets, epaulettes. The belt is for what Pati Palmer calls ‘essence of waistline’, not a fitted waist to show off hourglass curves. Which collar, ease level, and waist style are most flattering for you ? 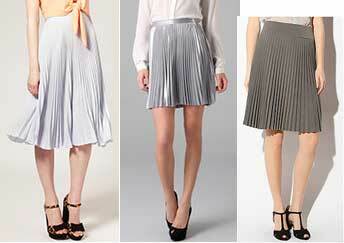 In Style don’t mention skirts, but You Look Fab says sunray pleats are the trend for work this season. Oh dear, I confess that isn’t a skirt style I can be enthusiastic about. I had a grey polyester one which I wore every day for 3 years in my penniless student days in the late 50s. Along with my father’s old shirts and a nylon yarn twinset I’d knitted myself. Lower calf length, worn with stockings as pantyhose hadn’t yet been invented. Everything indestructible. Nearly bomb proof stockings – can’t remember what the texture was called that made holes rather than ladders. Even they couldn’t always survive chemistry lab. . . (In case you’re wondering – in those days it would have been unthinkable to turn up to class in pants.) Not a wardrobe experience I want to repeat. True sun-ray style is not for DIY with those permanent pleats. Leave it to a machine specially devised to press them firmly in place all in one go. An alternative is a short skirt with many unpressed pleats. 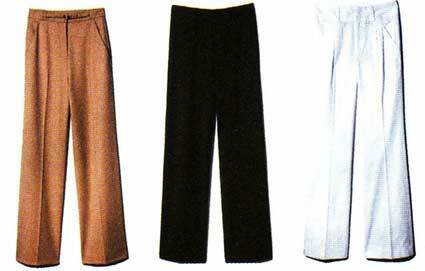 The winter trendy pants were peg-top, wide hips tapering to the ankle. This season it’s wide legs all the way down. With the top of the waistband at waist level, or no waistband. What In Style call ‘Annie Hall chic’. See Claire Shaeffer’s elegant couture Vogue 8498. This got rather long, so I’ve put the In Style workwear jackets and accessories in a separate post. Here are links to last season’s posts on the classic jacket and coat, and blouses, skirts, pants, dresses for winter workwear. Most photos from UK In Style magazine. This entry was posted on June 11, 2011 at 11:20 am and is filed under current fashion. You can subscribe via RSS 2.0 feed to this post's comments. Both comments and pings are currently closed. Another great post! I had been thinking of trying the perfect pleater from Clotilde, but had not seen anyone write about their experiences. Have you tried it? Thanks Nancy for the helpful and interesting suggestion. 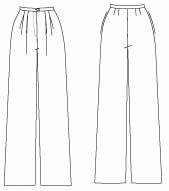 Make sure you get a pleater wide and long enough for a skirt. Many pleaters are just a good size for crafting. Here’s the link to the ones from Clotilde.